Uzes, a small town in the South-West of France, is remarkable for its slower pace of life and Mediterranean climate. It's towering medieval buildings offer a glimpse of its interesting history. In the 18th Century it was established as the first Duchy of France. With a population of a little over 7000 it remains a charming city to visit and continues to attract tourists from around the world. The town is located in the Gard department of the Languedoc Roussillon region. During Roman times an aqueduct was built to carry water from the springs in Uzes to the people of Nimes. It remains an incredible piece of construction. The vibrant town of Nimes is just 25 kilometres away. A little further on, the coast of the Mediterranean makes a delightful excursion. To get to Uzes by land from the UK can be time consuming - Uzes being about as far south as you can get - but thankfully planes fly regularly into the nearby Nimes airport. Property prices in the town are incredibly reasonable considering what the area has to offer. 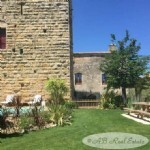 Currently available is a Large Maison de Village with Holiday Apartment for EUR 156,000. This spacious property is situated just 4km from the town. Do you know Uzes better than we do? Do you have photos of Uzes? Towards the north of the Gard department, in the Languedoc-Roussillon. Access: Nearby Nimes has both a TGV station and an airport with regular flights to and from the UK. 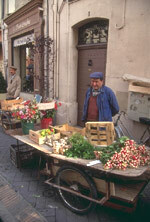 Economy: Tourism makes up a large part of the town's income. Interesting fact: The town is the starting point for the infamous Pont du Gard, an incredible Roman aqueduct.